Revolvers have a timeless quality to them that makes them a fan favorite among firearms owners worldwide. The Taurus Model 85 is a great concealed carry revolver that has a fairly reliable degree of function, but what’s the best Taurus Model 85 holster? The best holsters for the type of concealed carry that a Model 85 needs should have a good The best holsters for the type of concealed carry that a Model 85 needs should have a good material construction, protect the trigger from accidental actuation, and should fit comfortably on your body. We’ve pored through several great holsters for the Model 85 and found one that met these requirements and more. While some gun owners prefer either synthetic or leather holsters, there are actually many great nylon holsters that will also do the job. Out of the more than 30 holsters for the Model 85 that we tested, the Federal Hip Holster for Taurus really shined the brightest due to its great overall construction for carrying this revolver. Sometimes, with just about any holster material, you can actually damage the finish of your gun when you draw it. One of the best features of this holster, in our opinion, is the fact that it has a soft nylon material on its inside that protects your gun and smoothens your draw. Additionally, it also has some other key features like an adjustable thumb break strap and a snap that is easy to disengage with your thumb but is also secure. This is an ambidextrous holster. If you are a lefty or simply prefer to cross draw, then this is a great option for your Model 85. While the holster itself isn’t ballistic-grade Cordura nylon, it definitely should hold up to several years of use. You might notice that this holster has a deeper design; this provides a style of carry that won’t expose the hammer. You can adjust the thumb break snap for different types of revolvers. The holster really fits the Model 85 like a glove. The belt clip has a tendency to be a little loose. The snap can land on the back of the hammer, which makes it a bit difficult to close securely. For many people, the material of the holster is one of the most crucial factors to consider. Leather: Leather holsters have an extensive history. Everyone knows about the leather holsters of the television and movie westerns. These holsters are fairly iconic and look great on a modern firearm. Contemporary leather holsters should be made of durable hide and will last for years.The main drawback of this type of material is that leather holsters have a tendency to need to be broken in, which can take a couple of days or weeks of drawing. Additionally, despite the holster’s durable body, leather holsters aren’t scratch-proof. Nylon: Nylon has a bad rap with some firearm owners. The modern belief is that nylon isn’t strong enough for heavy duty firearms and that the material can fray and break over time. Modern nylon materials like Cordura are actually very strong, ballistic grade options that can last for years. In fact, our top pick is a nylon holster. Synthetics: These plastic-based materials are incredibly strong and won’t scratch easily like leather. Materials like Kydex and Boltaron are becoming increasingly popular because of their reliability and moisture-proofing.While synthetics can be a bit rigid, their chief benefit is that they are usable right out of the packaging. Where your holster is located is a matter of personal preference and draw style. There are several key concealment locations to select from but some are more popular than others. IWB: IWB stands for inside the waistband. These types of holsters clip onto your belt or pants and rest flush against your skin. 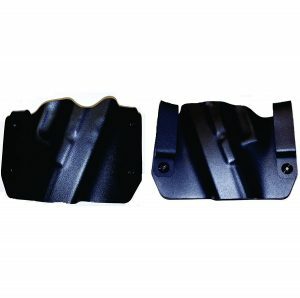 Since these are positioned in such a way that they are vulnerable to bodily moisture, you’ll find that many IWB holsters have sweat guards to protect your firearm.What makes these types shine is the fact that this is a very low-profile concealment method. Since it goes under your waistband, it’ll be hard for someone to see. Just remember that you’ll need a larger sized waistline to fit a Taurus Model 85 holster. OWB: Outside the waistband holsters clip onto your belt for concealment. These holsters require either a jacket or a shirt with the tails untucked for concealment. This means that this isn’t the best style of holster for the warmer months.As with IWB holsters, it’s crucial that your OWB holster has a secure attachment system so that you don’t accidentally draw the holster with the gun. The main benefit of these types of holsters is that they are more comfortable than IWB types. Additionally, OWB offers quicker access to your weapon. Pocket: If you’re looking for a holster that prints less than both the IWB and OWB holsters, pocket holsters shine in this regard. These holsters typically obscure the outline of your Model 85 so that it will look like you are merely carrying a wallet.The biggest gripe with this type is that you can never really have any other material in that pocket with a pocket holster. This is because pocket holsters take up a lot of space and you don’t want anything inside your pocket to accidentally actuate your trigger. Clip: Both IWB and OWB holsters can clip onto your waistband or belt. It’s important that this is a secure fit because if the clip is too loose, you can accidentally draw your entire holster. For the most part, seek out a steel clip so that you can know that your clip will remain strong, even after extended holster usage. Belt Loop: Belt loop holsters usually have a part that you run your belt through similarly to a belt loop. While the system may vary from a snap-on style to a simple raised material, all belt loop systems are designed to attach securely to your belt so that you can’t draw your entire holster. Paddle: Paddle holsters are similar to clip holsters but they have a larger clip that lies flat against your hip. These are typically very comfortable to wear, especially if there is a venting system. This Safariland product has a inside-the-pocket design that is actually very simple and effective. In fact, when you’re using this holster, you can simply drop your Model 85 into your pocket to holster it. 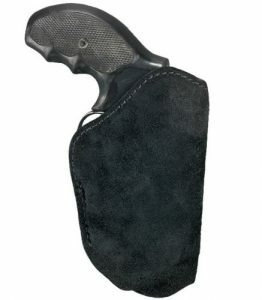 The material of this holster is suede, which makes it a good option for a holster that won’t damage your gun’s finish. This is a very attractive holster. The outer lining is reinforced so that the holster can stay open when there is no gun inside. It’s very easy to retrieve your Model 85 out of this pocket holster. Since it’s made of suede leather, this is a very rugged holster. There is almost no retention with this Safariland holster. The interior is made of plastic, which may seem cheap to some concealed carriers. While it does conceal the print of your gun, the material is very stiff, so it does bulge somewhat. The holster has a tendency to move to the top of the pocket when you’re drawing your weapon. Kydex is an excellent material for a holster because it will allow your Model 85 to audibly “click” into place so that you know that your weapon is retained. Additionally, Kydex holsters like this Bullseye option are very durable and lightweight. 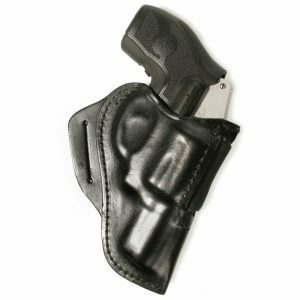 This holster has a curvature to it that makes it ride very well on the hips. The trigger guard is almost completely covered so that there is no danger of accidental firing. The audible click when you place your Model 85 inside of this holster really illustrates its excellent retention. This particular holster rides somewhat high on the hips, which is a feature that some gun owners prefer. As a Kydex holster, it simply won’t wear out or even deform over years of usage. Since it rides so high, much of the gun is left exposed along the top. The belt loops are a bit loose. Unfortunately, this Bullseye holster has no sweat guard. It doesn’t include a tensioning adjustment for increasing the level of retention. Blackhawk! specializes in crafting high-quality products that have a classic design; in fact, some of their leather holsters are crafted in Italy. The Speed Classic is based on an older, snub design that will allow for a quick draw with minimal slide. The leather is absolutely beautiful. It’s well-formed and has a hard bodied design that is shaped perfectly for .38 special revolvers. At the top of the holster is a heavy-duty elastic panel. The holster itself has a very high level of retention, but when you draw the gun forward, it stretches the elastic so that the gun comes free easily. The belting system is incorporated directly into the body of the holster; it even features a stabilization slot that keeps the holster close to your body and free from wobbling. This is a holster that is clearly designed to be discreet. It can fit a belt that is up to an inch and a half in thickness. As with all leather holsters, this may take you a bit of time to fully break in. Without the use of the elastic panel, it becomes nearly impossible to draw your Model 85. The final product on this list is another pocket holster that is perfect for a revolver. The Nemesis has a draw-friendly design that makes it fairly impressive for concealed carry. 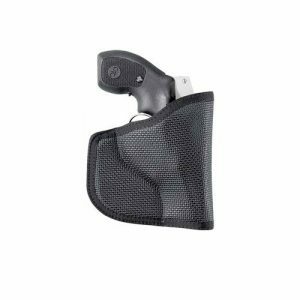 The print of your gun is almost completely concealed by the shaping of this Model 85 holster. The material on the outside of the shell is somewhat sticky; this means that it will be next to impossible to pull the holster out of your pocket on a draw. 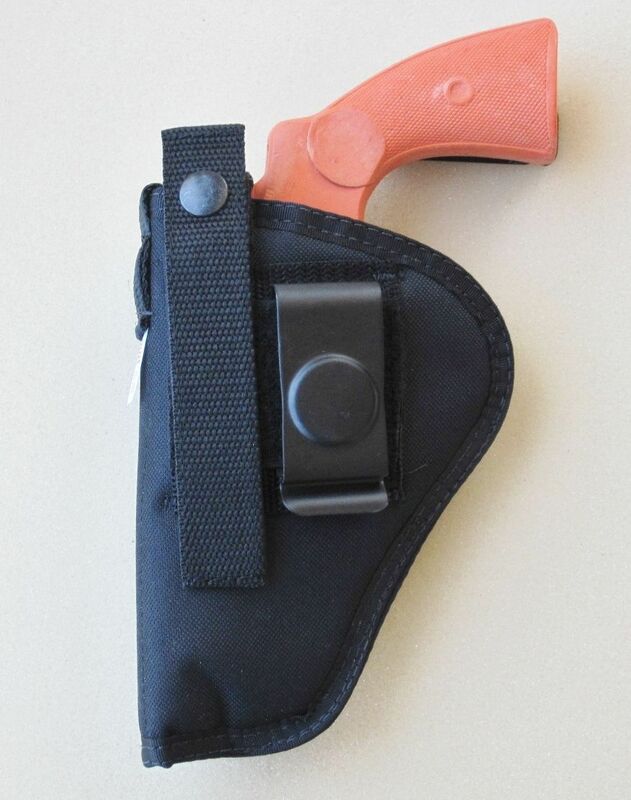 This holster is designed to be used by both righties and lefties. The internal material is fairly firearm-friendly; it won’t scrape the finish of your Model 85. There isn’t really anything to ensure retention of the Model 85 inside of the holster. When you do have to pull it out, you can expect the pocket to come out with it. The opening at the tip of the holster can collect dust and pocket lint. If you’re looking for a good holster for your Taurus Model 85, then there are some great options out there for you. The holsters that we’ve selected here are the cream of the crop out of the holsters that we’ve tested, so they should all serve your concealed carry well. One of the best features of this holster, in our opinion, is the fact that it has a soft nylon material on its inside that protects your gun and smoothens your draw. The best of these is still the Federal Hip Holster for Taurus. It has a durable nylon construction and has an impressive amount of adjustability for many types of firearms. Unlike the other products, this particular holster has features like a thumb break snap, and it also has a deeper fitment that accommodates the Model 85 very well.